South Korea’s LG Household & Health Care will purchase Tokyo-based cosmetics seller Avon Products for 10.5 billion yen ($96.3 million), marking its fourth acquisition in Japan. Avon Japan, an offshoot of the American direct sales beauty company, will become a wholly owned subsidiary of LG Household under plans announced on Tuesday. The LG group’s health and beauty arm is expanding its distribution network in the still-vibrant Japanese cosmetics market. LG Household’s first-quarter operating profit climbed 9% on the year to a record 283 billion won ($262 million) in results released on Tuesday. Sales for the three months ended March rose 7% to 1.65 trillion won. Despite a slow recovery in Chinese tourists visiting South Korea, demand for high-end products was strong at home and abroad, the company said. Avon Japan was sold to an affiliate of TPG Capital in 2010. Fellow U.S. investment firm Keystone Partners acquired it in 2016. LG Household & Health Care is one of the largest household goods and cosmetics manufacturers in South Korea and ranks second in cosmetics in the country after AmorePacific Group. The company’s cosmetics sales via duty-free shops have increased steadily due to a growing number of visitors from abroad. In addition, it has recently been active in mergers and acquisitions of domestic and foreign cosmetics brands. These factors have helped the cosmetics division gain a higher percentage of consolidated sales than the household goods division. In 2001, LG Household & Health Care was established as a spinoff from LG Chem, taking over the cosmetics business from its parent LG group, one of South Korea’s global conglomerates, which started out as a cosmetics producer. The company is built around three core divisions: detergent and other household goods, cosmetics and soft drinks, and its overseas operations focused on cosmetics. The company is enjoying brisk demand for its high-end cosmetics brands at home and in China, including the Whoo line, based on traditional Korean herbal medicine, and Sum 37, a brand that uses naturally-fermented plants from around the world, at home and in China. The Face Shop, the low-cost brand acquired by LG Household, has proved popular with young Asian consumers. Meanwhile, the Korean company is preparing to keep pace with the era of an aging society through its Japanese subsidary, EverLife, that sells inner beauty products and health products. 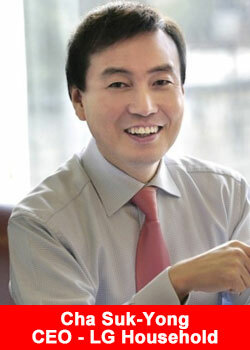 LG Household & Health Care Vice Chairman Cha Suk-yong, who previously worked for U.S. consumer products maker Procter & Gamble, serves as CEO of the South Korean company. The company is vigorously pursuing new product development under the leadership of Cha, who is noted for his P&G-style management approach emphasizing innovation. Get more information, fact and figures about Avon Products, click here for the Avon Products overview.